A couple, Natalie Heimel and Edward Mallue, who planned to get married last weekend near President Barack Obama's vacation spot in Hawaii had a last minute disruption to their wedding plans. They were finally married on Sunday after having to switch their wedding venue because of President Barack Obama's golf game. The bride and groom — both U.S. Army captains — were scheduled to tie the knot Sunday at Kaneohe Klipper Golf Course, a military course with ocean views near Obama's rented vacation home in Kailua. But on Saturday, they were told they'd have to move their wedding away from the 16th hole because Obama and his friends planned to golf. According to HuffPo, a person familiar with the incident says the White House didn't learn about the conflict until after the fact. The person says Obama called the bride to apologize and to offer his congratulations. The person wasn't authorized to comment publicly and requested anonymity. 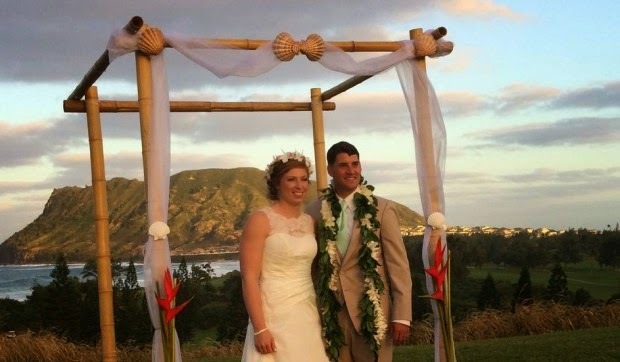 Natalie Heimel and Edward Mallue Jr. were due to be married at the Kaneohe Klipper Golf Course on Sunday when they were informed just one day out that they would have to relocate because their commander in chief wanted to play a round. The groom’s sister, Jamie McCarthy, told Bloomberg. The couple had actually invited Obama to attend their nuptials, knowing he would be in town for holidays. He’d sent his regrets earlier Saturday.